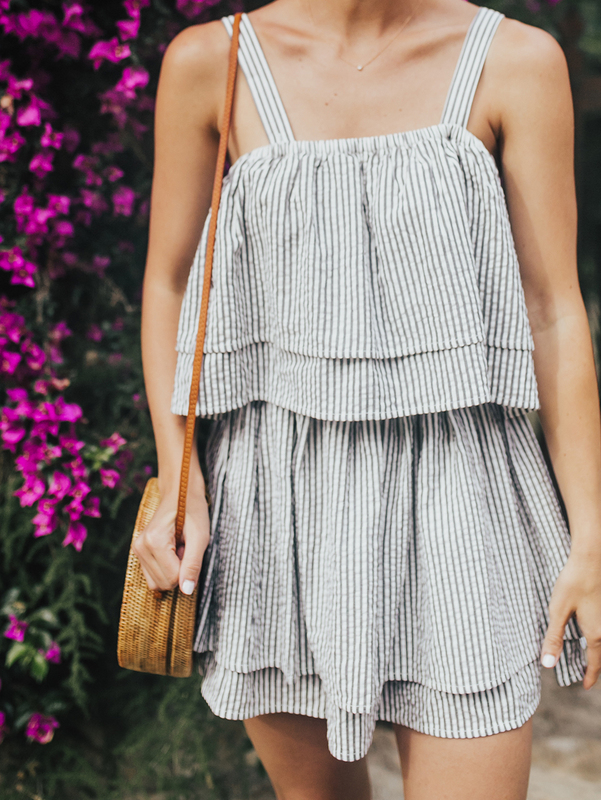 Psst…if you’re headed somewhere sunny, I’ve got ya covered – sharing more darling striped dresses and rompers! My dress is by Tularosa from REVOLVE and ooohhh my goodness am I in LOVE with this thing! This brand makes the most beautiful quality pieces – worth the price tag. This dress can worn as a “cold shoulder” style, as well…we had just come from the beach prior to shooting this, so I was sticky and preferred the more breathable option of wearing it, ha! I’m wearing an XS for reference. (This dress is low in stock, grab it while you can!). My bag is from Etsy and it’s officially become my little world travelin’ sidekick! It’s got that vintage vibe and always adds a feminine touch to an outfit. Love love love this one! My shoes are by Steve Madden…oldies but goodies and a nearly identical pair is currently on sale, too – linking to them below. I love this look – perfect for summer! That bag is adorable too – I would have never thought to look to Etsy for those. Definitely going to search for a cute new one there. Ooh let me know if it grows at your house! I’d love to have some of that pretty color in my backyard. 🙂 Looking adorable, girl! I’ll keep you updated for sure! We just cleared some ugly bushes out of the front area…currently on the hunt for a pretty replacement! Will let you know as we do some research…XO!